The Student Development and Engagement team provides support to help our students have the best possible experience at the University. We support our diverse range of engineering students – under-represented groups at University, students transitioning into tertiary study, and more – from Orientation through to employment. Our team can also act as a central point for help if you’re struggling, stressed, or have experienced a traumatic event that will have impact on your study. Feel free to drop by and see us, or email us at foe-engagement@auckland.ac.nz. The Student Development and Engagement team also works closely with our faculty’s student clubs to help provide engineering students with social, professional and academic opportunities, and can also link you to support services such as counselling, financial assistance, mentoring, and childcare. 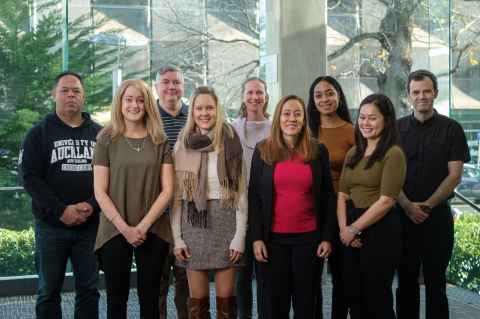 We are also responsible for initiatives such as Orientation, the Part I Assistance Centre, Women in Engineering Network (WEN), Tuākana for Māori and Pacific students, the Rainbow Engineering Network, information evenings with prospective employers, and the Postgraduate Buddy programme. Michael manages student development, engagement, support and retention initiatives to enhance students' experience. Chris provides a range of development and engagement activities for all students. He works closely with Campus Life and the faculty’s student clubs. Alcione supports all engineering students with their wellbeing, pastoral care and learning support. She is also the primary Student Support Adviser for equity students. Steve supports all students with their wellbeing, pastoral care and learning support. He is the primary Student Support Adviser for Māori and Pacific students. Naomi is focused on the participation, retention and success of female engineering students. She works closely with the Women in Engineering Network, and engages with schools to raise the profile of Engineering as a career choice for girls. Jonathan facilitates employer networking and fosters industry relationships, along with graduate and intern recruitment. He also provides advice and support to students on career options. Meleane supports all engineering students with their wellbeing, pastoral care and learning support. She is also the primary Student Support Adviser for international students. Monique provides a range of development and engagement activities for postgraduate students.